Bosphorus and the city of Byzantium. 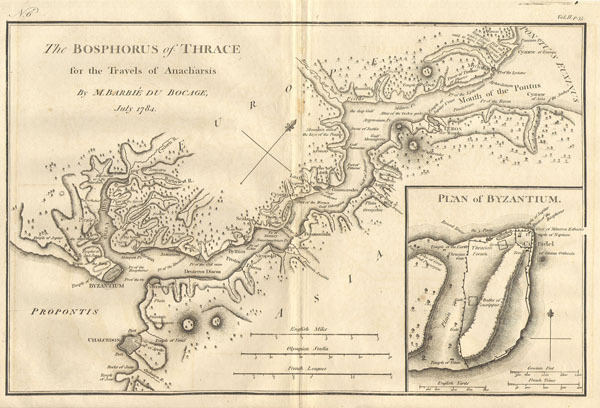 This lovely map, depicting the Bosphorus and the city of Byzantium, was prepared by M. Barbie de Bocage in 1784 for the 'Travels of Anarcharsis.' The map shows the narrow naval passage from the Propontis (Sea of Marmara) to the Pontus Euxinus (Black Sea). There is a beautiful inset plan of the Horn of Byzantium. Today Byzantium is Istanbul, but the horn and many of the ancient structures still exists. This map also shows the area in considerable topographical detail.